How will Gigabit Systems save me money? 1. Building an Internal IT department. Keeping things internal is often a preferred choice for business owners but it can come at a huge expense and is usually far from optimal. Yes, you read that right. 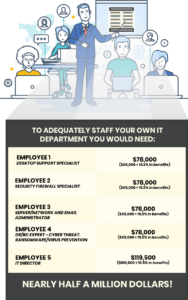 It would cost you nearly half a million dollars per year to staff your own IT department. And that’s not even considering the extra office space, hardware, software and added human resources expenses. In reality, perhaps this isn’t all that much. After all, one simple ransomware attack could cost you hundreds of thousands if you’re not adequately protected. Find out more about this in our 2018 report. But running your own IT department is extremely resource intensive and difficult to scale. What if there was a more powerful solution for just a fraction of the cost? You could say that working with Gigabit Systems is like having your very own IT department. But really, it’s far more than that. Instant scalability – As you grow, we’re always ready to provide you with the added support you need. Need to make cut backs? Just think of the human resources nightmare you would have to face. Not with Gigabit Systems. More resources for less – Why limit yourself by the size of your IT department. When you work with Gigabit Systems you’ll be working with a team 10 times as big for just 10% of the cost. Subject matter experts – Working with a larger team means we have a wider range of experts on staff, ready to tackle any problem and get it right the first time. Cheaper hardware & software – We’ve spent the last decade building great relationships with even greater IT providers.  When you work with Gigabit Systems, you too can benefit from these relationships, getting discounted rates on hardware and software packages, saving you time and money. Fast incident response – Our Ransomware Rapid Response Team (3RT) is ready for any situation. All this, for just a fraction of the cost! Want to find out exactly how much it would cost you to start working with Gigabit Systems? Request your free network assessment today. Want to find out more about our services first? Click on the button below. What is a Managed Service Provider (MSP) and what is the benefit to my company? The term managed services came about in the late 1990’s. This was when we all started to rely on IT to run and grow our businesses. But, we needed a way to use IT efficiently and keep costs down while doing so. This is when subscription-based IT services came to be. It was a huge benefit because we could purchase a comprehensive package of IT services for a predetermined monthly fee. This was great! We could now have an affordable level of IT management that only the big companies had had before. How is Gigabit different than other MSP’s in the marketplace? Real managed service is more than just IT security or Help Desk support. It is the type of IT management that’s an extension of your business rather than just a “vendor.” A Real Managed Service Provider (MSP) is your “IT Partner” so to speak, and a member of your team. That is what Gigabit truly is. We are an MSP who provides true managed services, looks at your business as a whole and manages your network and infrastructure in a comprehensive way. At least 75% of the ‘MSPs don’t follow this methodology. Instead, they provide a “break-fix” IT service on a set payment schedule. What comprehensive services can I expect from Gigabit? Proactive: Wouldn’t you rather prevent a “disaster” than try to recover from one? A proactive IT strategy is the best approach to IT management. With a proactive/preventive IT service, you can reduce the number and severity of issues. At Gigabit, we will use Remote Monitoring & Management (RMM), to detect problems and address them before they disrupt your operations. Plus, we will automate scheduled maintenance to keep your devices functioning at peak performance and to extend their useful life. Beware, many MSPs simply install a few solutions to track your IT devices. With genuine managed services your MSP will also identify workflows and processes to prevent potential problems. Proactive IT Service prevents network and infrastructure problems by ensuring your hardware and software are properly maintained and remotely monitored. Security: Setting up a successful cybersecurity defense is very challenging. You can’t-do this on your own any longer. The criminals are constantly changing their tactics and adding more tools to their arsenals all the time (such as spear phishing and ransomware). Cybersecurity is a top priority. The criminals are no longer just going after the “big guys.” It’s easier to break into the networks of smaller businesses like yours. Reactive: When it comes to IT, something is bound to go wrong. That’s why you need real managed services with a 24/7 Help Desk, a Network Operations Center and Emergency Support. At Gigabit we have tiers of Help Desk Support that handle specific types of issues. We have a documented process to quickly escalate service if you need it. Tier 1: Typically answers your call. If they’re busy, another team will kick in. Tier 2: Handles escalated issues that Tier 1 couldn’t resolve. These issues are often more complex and may require a call to a vendor with a deeper technical understanding of the problem. Upper Tiers: These are the most experienced techs. They will have ready access to all your systems and security solutions. This is the “critical care” team for your IT. A real MSP provides Emergency Support with 24/7 Hours, guaranteed response times, and additional resources in times of crisis. Consultative: A real managed services provider such as Gigabit, offers outsourced CIO Services that will cost you much less than hiring in-house advisors. We provide the depth and breadth of expertise you need to take advantage of today’s technologies. Provide a thorough Needs Assessment to quantify the level and type of technology you require to achieve your goals. Develop and implement a customized plan to meet your objectives. Strategically plan for the technologies you need for today and tomorrow. Assist with procurement of hardware and software to get you the best prices and best value possible. Develop IT policies and procedures to ensure the security of your IT, compliance, as well as business continuity & disaster preparedness. Address whatever concerns or questions you have about your technology. Manage your IT administration details so you can focus on your core business capabilities. Why do I need Gigabit? Because IT systems have reoccurring issues. As with any kind of technology, a peak-performing IT system demands ever-changing and specialized skills. With constantly changing technologies, there’s no way an in-house staff can stay up to date on the latest IT solutions. Because of this, downtimes and interruptions occur and build on themselves. This costs you in productivity, time and money. A genuine Managed Service Provider (MSP) will monitor your IT system remotely and stay a step ahead of downtimes and problems. Your IT costs fluctuate, spike and can catch you by surprise. If yours is like most businesses, your IT costs vary, and can suddenly increase and stress your budget. With true managed services, you’ll have the assurance and peace of mind knowing that you’ll always pay a fixed, predictable fee every month. When you do require extra service or support, your monthly bill remains the same. This allows you to stay on budget. Your confidential data is at risk. In today’s world of cybercrime, devastating viruses, and extreme weather events, your vital business data could be stolen or destroyed in a moment’s notice. You need the assurance that it’s housed securely offsite in a high-security data center that’s maintained and monitored 24/7, and accessible at any time. A true MSP can do this for you. You need IT service when and where you need it. Your MSP will monitor your IT system 24/7, and if issues arise, they’ll identify and resolve them before they impact your operations.